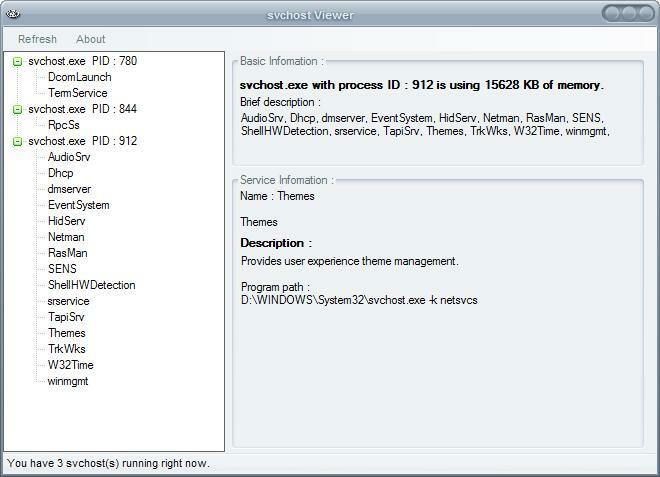 Svchost Viewer is a Windows program that has been designed to reveal the services behind specific svchost.exe processes on machines running Windows. The software program of choice to analyze processes is Process Explorer from Sysinternals (usually), and while it is the go-to program for many, its feature richness and functionality can be quite intimidating at first. Yes, there are other applications that do the same but Process Explorer is probably the application that most professionals and tech-savvy Windows users use for that purpose. Note: Microsoft changed how svchost processes are displayed on Windows 10. The operating system lists one process for each svchost item, and reveals what it is so that it is a lot easier to find out what a process does. The Open Source program Svchost viewer limits itself to the scvhost service which makes it somewhat of a specialized program that may be useful to users who want to know more about the services that run under svchost processes. It does not provide additional information that a user could not get out of Process Explorer, but it provides the advantage that it is not overladen with additional features and other services so that it is a lot easier to use. It answers the question why multiple svchost processes are running on the system, and may even provide you with information on how to reduce the number of different processes. The software program scans all svchost processes that are currently running on the system and displays them in a tree view that can be expanded to show additional information like the services that are run under each svchost entry. The svchost process caused lots of confusion in the past as users did not know why why several svchost.exe processes were running on the system when they opened the Windows Task Manager or another process viewer. The services under each svchost process are listed in the left pane, a click opens detailed information about each service on the right larger pane of the application. It details the amount of computer memory a svchost process is using as well as a description and program path of the services it has spawned. While it won't provide you with any recommendations, you can use the information it provides to research these services, and turn off those that you don't require. The svchost viewer application is portable and should run under Windows XP, Windows Vista and Windows 7. The Microsoft .net Framework 2.0 or higher is required to run it. The application itself takes up only 40 Kilobyte on the hard drive. Update: The last compatible version of Svchost Viewer is listed as Windows 7. While that is the case, it runs fine on newer versions of the Windows operating system including Windows 10. The latest version of the program, released in 2010, features a couple of additional options that may make live easier for you. First, you can click on service control in the menu bar at the top to stop selected services right from within the interface. Second, an option to generate a plain text report is available which lists each process and the services running under it. Last but not least, you may also open the Windows Services Manager straight from the application. With this addon you can make your priorities of the processes always what you selected – remember. You can also hover your mouse over a process (svchost) and see what it actually runs inside. Just point on svchost.exe in Process Explorer, you will get the same result as in this external program. The only difference is displaying data in tooltip (@procexp). Erroneously states I have 0 svchost processes running. Suspect I may not have the proper .net version required, (running xp sp3). Author may wish to add some sort of requirement checking upon launch. oops, I do have .net (1.1 2.0 3.0 & 3.5 ) so that’s not it. My Bad. re-downloaded and it works perfectly.. Nice! Unblock friendster, facebook, myspace and even youtube!